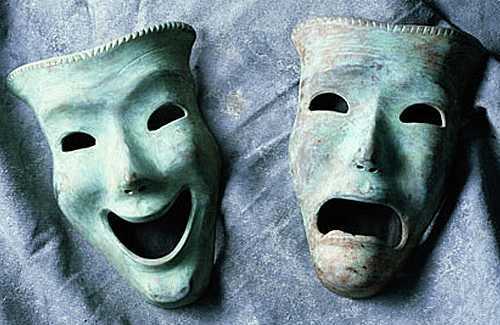 Shakespeare mastered the arts both of comedy and tragedy; occasionally they play simultaneously. Hence the spectacle of NIWA’s slapstick, slapdash, cobbling together of any old temperature series, set against the patient, single-minded, skilled-amateur analysis by members of the Coalition. The weather station at Lincoln is one of the seven which make up the official NZ Temperature Record over the past 100 years. 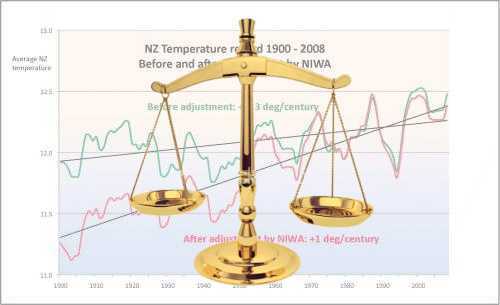 It shows a strong warming trend as a result of downwards adjustments which NIWA made in respect of the pre-WW2 period. But those adjustments rely upon a curious methodology which is not supported by any of the peer-reviewed literature. The original temperature data for the Lincoln weather station – recorded by the NZ MetService, and now downloadable from NIWA’s official Climate Database – shows no warming trend over the past 100 years. The Schedule of Adjustments (SoA) prepared by Dr Brett Mullan and posted on the NIWA website on 9 February 2010, shows five downwards adjustments in the period 1881-1943 and two upwards adjustments during 1944-75. All seven alterations to the NZ MetService climate database are trend-favourable, and comprise the sole source of the reported warming trend. The NIWA SoA offers no reasons for the six adjustments, but in answer to a Parliamentary Question it was stated that the weather station moved around within the grounds of Lincoln University. The unweighted average is -0.65°. They produce a warming trend of 0.52°C/century. NIWA has stated on numerous occasions that the source of these adjustments was Appendix C of a 1981 doctoral thesis submitted by a former employee, James Salinger. The unweighted average is -0.28°. They produce no warming trend. The thesis estimated the first five Lincoln adjustments by running comparisons with Dunedin, Hokitika and Christchurch. The project was complicated by the fact that all three of these stations were themselves adjusted during the same period. As the detailed data and calculations have been mislaid, replication of the full Salinger process is no longer possible. There are many reasons why the Coalition put together an application for a judicial examination of the national temperature record. I hope those who think the Coalition is the Flat-Earth Society are reading these explanatory articles and learning something beyond their first nervous, knee-jerk reactions, because it’s in the interests of all that NIWA be made to explain what they have done. The members of the Coalition are the only ones to investigate what NIWA have actually published; when will some others do the same? Six of the stations in the NIWA “Seven-station Series” are isolated ones. Lincoln is the fortunate exception in that it had up to eight “near neighbours” at relevant times. Rhoades & Salinger (1993) (R&S) analysed site changes at the Canterbury stations during 1870-1990. In respect of Lincoln, the neighbouring stations used were those that had complete data and no site changes of their own for two years before and after the subject site change. By way of example, the paper checked for discontinuities in mean daily minimum temperatures. Only ONE Lincoln site change during 1900-50 was found to have any significant effect on the recorded minimum temperature. In April 1944 the station had moved 40 metres north, away from a row of pines, and measurements immediately dropped by 1.0°C. The Lincoln component of the NIWA Seven-station Series is clearly wrong. NIWA’s adjustments to the historical record are flatly contradicted by R&S – a paper which NIWA cites as an authority. • The thesis compares isolated stations hundreds of kilometres apart. R&S uses only close neighbours for comparison — and rejects comparator methods for isolated stations. • The thesis has no rules for excluding comparators (e.g. site changes and missing data) or before-and-after time periods. R&S has strict rules. • The thesis uses simple averages. R&S uses parallel cumulative sums (cusums). • R&S describes and applies statistical techniques for assembling a correlation matrix, station weighting and assessment of confidence intervals. The thesis relies on simple arithmetic. • R&S stresses the dangers of adjusting records of isolated stations, and recommends that adjustments be made “only when there is consistency amongst a range of tests, and a high level of statistical significance.” The thesis applies no tests. • The thesis suggested six adjustments. R&S supported only one of them. This view seems to be supported by the Rhoades & Salinger analysis, which favoured none of the pre-1927 adjustments discussed in the thesis. Salinger’s approach relies almost entirely on inter-comparison of weather stations — any weather stations. He departs from the scientific literature in his willingness to act upon minute comparisons between unrelated stations separated by vast distances, by mountain ranges, by wind patterns, by seas or by climatic zones. “Better than none” may be damning with faint praise, but even this over-states the argument. The international scientific literature leaves little doubt that comparisons between non-neighbour stations is “worse than none”. R&S also noted that adjustments of early records involve much greater uncertainty, and a greater degree of subjectivity, than adjustment of a station with many neighbours. A series of statistical tests are therefore required. In the thesis, the Lincoln adjustments are driven by comparison with Dunedin, Hokitika and Christchurch. Simultaneously, Hokitika adjustments are driven by comparison with Lincoln, Dunedin and Christchurch. Dunedin is adjusted in comparison with Lincoln, Hokitika and Christchurch. And so on. No variation is tolerated. If one station is out of line with others by so much as a tenth of a degree, something is adjusted. Then that changes the averages by which all adjustments are calculated. And this merry-go-round means that a Lincoln adjustment might well change the Hokitika figures which are used to adjust Lincoln… and so on, ad infinitum. During the first half of the 20th century, all of the long-record stations in NIWA’s Seven-station Series are inter-compared, and all anomalies are adjusted, until the anomaly records of the seven stations become almost identical. In this iterative process it is impossible to separate chickens and eggs, but let us assume that the prime mover was Auckland. If its temperature moved upwards by 0.5° in (say) the 1920s, then Dunedin and Wellington might well be adjusted to mirror that change. Hokitika and Lincoln would do likewise and this would flow on to Nelson and Masterton. We now have a nation-wide warming trend with all geographic areas reflecting the same movement – which actually occurred only in Auckland. We know from Hessell (1980) that shelter and urbanisation caused both Albert Park, Auckland and Christchurch Gardens to develop into ‘heat islands’. Salinger’s methodology would have assisted these flaws to infect the other six stations in the Seven-station Series. The basis for the NIWA adjustments to the Lincoln temperature records has not been disclosed, but they are NOT consistent with either the Salinger thesis or the Rhoades & Salinger paper, as claimed on the NIWA website. As the thesis doubts the reliability of the pre-1927 Lincoln data, this station ought not to have been included in NIWA’s Seven-station Series. Salinger recognised limitations in his simplistic methodology, but considered his approach to be “better than none”. No peer-reviewed published paper supports the ‘non-neighbour comparison’ used in the Salinger thesis. That method is opposed by all the international scientific literature, including Rhoades & Salinger. The thesis approach involves endless circularity, resulting from the inter-dependence of moving targets. The thesis methodology encourages convergence until near-uniform results are obtained for all stations. If a trend occurs in one or more stations, this is likely to be passed on to all stations. We don’t know how Salinger sought to grapple with the circularity and convergence problems inherent in his unorthodox methodology. His worksheets were lost in the 1980s and there are no copies. The adjusted Lincoln series is clearly wrong and should be removed from the Seven-station Series. Great work! I see some very good Parliamentary Questions in this! Barry – an excellent piece of hard work on your part to dig and dig into the nub of the obfuscation which NIWA broadcasts. Thank you for your tireless efforts. I heard a scientist comment that mercury thermometers are today virtually unchanged from the 19th Century, just as reliable and just as easy (or difficult) to read accurately. Accuracy is not greater than 0.5° and I believe, though couldn’t swear to it, that ordinary temperature readings are usually rounded to the nearest degree. Which for ordinary purposes is fine, since I don’t think we can detect a change that small anyway. All these hundred-year-old measurements were taken for the purpose of weather forecasts, and were rounded to the nearest degree. In any event, they were a snapshot of the minimum and maximum in the previous 24 hours – which can be more than 1.0° different than an actual daily average. These figures were then averaged monthly, and rounded again. As sheltering trees grow, they produce progressive warming. The same effect comes from nearby population growth and the spread of concrete/tarseal. But NIWA doesn’t seem to make adjustments for any of the factors which produce a warming trend. Yes, it has. I’ve never had a good look around there. I believe one of our scientists is involved with a related effort in New Zealand. I’ll talk to him and see if we can help.